Chancellor Angela Merkel said Germany will need to provide more incentives to meet a goal of having 1 million electric cars on the country’s roads by 2020. Merkel is far behind in her push for 1 million electric autos in part because her government has balked at incentives like those offered in France, where consumers receive as much as 6,300 euros ($7,840) to help cover the higher cost of low-emission vehicles. Germany, which has about 24,000 electric autos on its roads, is considering offering a tax break for zero-emission vehicles sold as company cars. 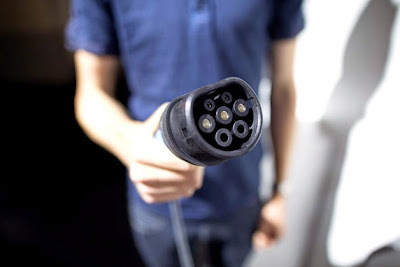 “We’re far from our goal to establish Germany as a leading market for electro-mobility,” said Matthias Wissmann, president of German auto-industry lobby VDA. “The government needs to act” on plans such as the corporate tax reduction. The chancellor is trying to reduce emissions by pushing the country’s auto industry to build more electric cars after French, Japanese and American carmakers got off to an early lead. German auto manufacturers will offer 17 electric models by the end of 2014, and another 12 will go on sale next year, according to the VDA. Merkel’s cabinet announced plans in September to offer electric-car buyers special privileges, backing a bill that would enable municipalities to offer drivers of battery-powered cars, fuel cell vehicles and some plug-in hybrids free parking and the right to use bus lanes. The country has 4,800 charging stations, said Henning Kagermann, a former chief executive officer of software maker SAP who is heading the government’s electric-car effort. Transport Minister Alexander Dobrindt said Germany will add 400 stations at rest stops along the autobahn network to make it possible to travel across the country with electric vehicles. Zero emission vehicles from German automakers include Bayerische Motoren Werke AG’s i3 city car as well as electric versions of Daimler AG’s Smart two-seater and Mercedes-Benz B-Class. Volkswagen AG sells the Up! and Golf with electric motors. The offerings follow the entry into the market of Tesla Motors Inc.’s S Model, Nissan Motor Co.’s Leaf and General Motors Co.’s Volt. Germany was a transport pioneer when it opened Europe’s first car-only highway in 1921 in Berlin. Its free-wheeling autobahn, which often doesn’t have a speed limit, has spurred a motoring culture, helping BMW, Mercedes and and VW’s Audi and Porsche brands to dominate the market for high-end cars. The government announced plans today for a conference next summer in Berlin to discuss how the country can make further progress in electro-mobility.